Here comes another amazing game by Rovio gaming industry.This adds another name to the angry birds list.Recently the Angry Birds StarWars teaser was uploaded into the youtube by the rovio mobile. And since then the news about the angry birds next game was officially going to be launched very soon. Rovio mentioned in its teaser that the game will be launched on this Nov 8 2012 and will be available to all the famous gaming platforms in the market like Android , iOS etc. All ready the Angry Birds StarWars goodies are being sold in the toy stores and rovio stores. As we all know the previous game Angry birds Space was a successful game.As it was a physics space oriented game it was new game play & thus made it succeed. Now similarly another game comes with even more space oriented gameplay and all the features are yet to be revealed on the full length video teaser on Nov 5 2012. The teaser shows all about the game play and some interesting game play improvements.Like the luke and leia in cinema here also the characters are present and costumes are designed in such a way similar to that seen in the film. Angry Birds StarWars was created based on the starwars series films.The creator rovio gaming company has introduced that concept in to angrybirds StarWars gameplay.The powers available to them are related to the film concept and more of it is to be tba. This time the developer created the game very interesting way.Gamer will be asked to choose his option whether Rebelion or The Empire (Darkside). Improved Graphics quality in the game. New improvements in the costumes of the angry birds. New improvements in the powers of the angry birds. 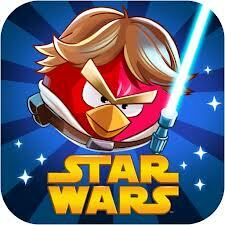 Special powers for the angry birds like compared to the star wars. Yes it is obviously awesome. Gamers eagerly Waiting to play the new game.Don't worry this game will be hitting the markets on November 8th. On that day the game will be available on Android market, app store(iOS) , Windows phone , Kindle fire , MAC , Windows 8 and PC. For more updates stay connected to us. Any comments or suggestions drop down in the comment box.